My own mother is an anomaly, by most accounts. She is eccentric, her moods mercury. I try not to blame her when I call her and she ends the phone call midway through my regular invocation of I love yous. She is spiteful sometimes, and it hurts. She is smart. My mother is an artist. Growing up, the bookshelves in our houses — first in Pennsylvania, and then in New York City, where we still live today — were cluttered with multisyllabic words. At seven, I was deeply confused by the thicket of anthropological texts stacked high in her studio and commensurate Nina Simone and Norah Jones songs playing on the radio. Her work focuses on themes like tourism and femininity, and is based heavily on postcolonial theory. 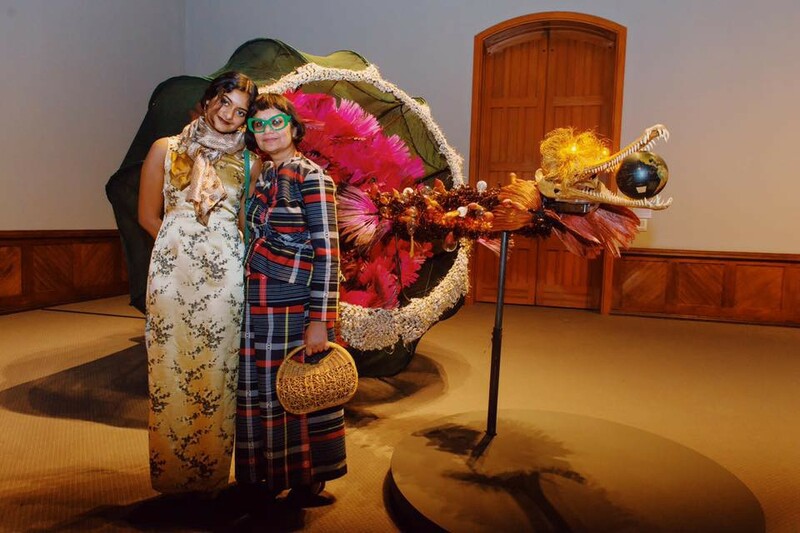 It often draws from her experience as someone who traces her lineage from what is now the border between Bangladesh and India, whose mother experienced the trauma of war. She has spent her life trying to piece together what it means for her to have moved from Calcutta, to Manchester, to Queens. At the time, I didn’t understand her, didn’t know who Claude Levi-Strauss was — and why I should care? Everything she said seemed out of reach, and so too, was it out of reach for my father, a professor in the sciences. We made fun of her, I am ashamed to say. I think my father did it because her knowledge of theory tapped into his own insecurities about his ignorance. As for myself, I was a child, happy to accept the ordering of my household in this way. After all, my father was the one who gave me hugs before bed, my mother the one who struggled to make it to recitals and concerts. She was busy building her career. To me, she was strange, speaking with long words and heavy metaphors, when she did come. I didn’t understand her. So I sided with my father. As a high schooler, I did not have the tools to understand my placement in the world. I could not have told you my lineage’s relationship with colonialism. I didn’t know that my mother’s history was a history stretched across a new border. Perhaps part of it was that I was callous. But a miseducation which foregrounded Whiteness and White history in the United States contributed to my disregard and ignorance. Mine was a most traditional of educations: a background in “Atlantic History”, a study of conquistadors, a few years of Latin, and a narrative arch that ended with the neoliberal “beauty” of the 21st century. One of my few respites was English class, where Black professors taught us Black literature. The summer after my sophomore year, I received a first edition of The Fire Next Time by James Baldwin as a prize for an English award. The book sits on my bookshelf at home now, alongside all my mother’s volumes. After I read that book, I began to realize the political power of writing, the way it can disrupt existing narratives of the “truth.” I saw writing as a site of confronting power, but had not yet envisioned liberation. As I got older and began to fall in love with the potency of writing, I struggled with a binaristic vision of the world, replete with racial lines and exclusivity. My understanding of what a future could hold for me was modeled after what I saw as the primary tension of the world, the tension between White people and Black people. Anti-Blackness weighed heavily on my mind growing up alongside Black artists and Black communities. And so I swore off my right to write, because I didn’t believe that I deserved to take up space. Justice too, was a binary for me, and justice meant silencing myself to make way for Black writers and Black art. I was part of the problem, I knew. I had listened to my mother enough, read enough, to know this is the case. I spoke to my English professor many times about this concern, and though he tried to convince me that things were more complicated than I realized, I didn’t believe him. I couldn’t write in the name of justice, so I convinced myself to fall in love with law. I watched Shonda Rhimes’ Scandal religiously, wanting to be just like Olivia Pope. This state of affairs continued until last semester. I was insecure about my writing, because no one told me it could be useful in advancing justice. As I waded further into Yale, I became more cognizant of how my socioeconomic privilege figured further into the reasoning for silence, this intention to void my person in language. I fought with my mother almost weekly first year. I did ridiculous things in the name of pain. I went on a keto diet. I overcommitted. I didn’t sleep some nights. I cried in my top-bunk. I forgot what home meant. I imagined justice as an unpliable, sticky liquid. I became friends with a Black writer and felt further implicated in every corner of injustice with no tools to fight back. And then I took Intro to Third World Studies with Professor Gary Okihiro, a well-known and well-loved Ethnicity, Race & Migration course. Professor Okihiro lended me the language I needed to understand and dignify my mother’s work, and to understand my own social formation. I began to call my mother weekly to chat about the readings. She had read everything I had read when she was in graduate school. For the first time in my life, I started to see myself in the mirror in the morning. I started to realize that my mother and I are part of a community that has always struggled to be understood and to understand the world in turn. I was talking to Professor Okihiro the other day, about the naming of the program as “Ethnicity, Race & Migration.” Our conversation eventually touched on the inefficacy of these words in communicating what it is that we students and professors study. Perhaps, we came to conclude, it might be more apt to say that ours was the study of Power and Liberation. These words helped me understand what my mother ultimately seeks with her art: to understand power, and to liberate herself and her people. Professor Okihiro also helped me refine my understanding of language. Justice, he explained, was perhaps not the word I meant. Justice implies the presence of authority, that there are small acts that can be done to create equity. Perhaps, he seemed to say, all I had meant all along was liberation, a freedom from all oppression, the defanging of power into something more beautiful and more tender: love. I have come back to writing these days, having learned to extricate myself from the binaristic language that my classes in high school gave me. Studying power has taught me how it has shaped my body and my life. You want to know why Ethnic Studies is important to me. The truth is here before you. Ethnic Studies at Yale has made me feel whole again. It has made me understand the struggles my mother went through, it has dignified my person with the right to speak, and perhaps most importantly, it has taught me that justice, and perhaps more importantly, liberation, is not something that is singularly promulgated by the law. Liberation can be inched towards with writing, art-making, seeing the future. The path to liberation lies in is loving yourself and in dignifying yourself with the time to learn to grow. Liberation is something my mother and talk about making together. The path to liberation is littered with actions: calling my mom on Sunday afternoons, talking to her about Dr. Kellie Jones’s piece, and did she have any recommendations? It is the understanding between us that the institutions of this world have tried to figure our people, the people of the Third World, out of existence and into silence. It is owning up to anti-Blackness in the Asian American community but realizing that it is a part of deeper and more insidious mechanisms at work. It is understanding every way power inches into our lives. Recalling those different communities we drifted to, I think I was in the fight all along: the coalition of artists in Brooklyn that showered me with love and tried to pass the torch of passion and resilience down to the next generation. I thought my hand was burning this whole time. But Ethnic Studies has finally taught me how to grasp the handle, and with this light, to glimpse our future: liberation. Imagining Power and Liberation Studies with My Mother was originally published in The Yale Herald on Medium, where people are continuing the conversation by highlighting and responding to this story.